My fixer is based on a 1967 (I think) Schwinn Typhoon frame with a Tange road fork. 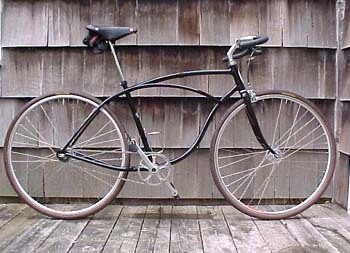 The kickstand mount and seat stay bridge were removed by a frame builder acquaintance and replaced with lightweight tubing. He also rebrazed the cantilever tubes to the seat tube (I had broken a weld here on another frame) as well as the down tube and added water bottle mounts. A local painter shot the clear coated gloss black Centauri paint. The seatpost was made by a machinist who used a Redline BMX post for inspiration and the saddle is a very sweet Brooks Pro Select. I laced the Campagnolo high flange hubs to 700c Mavic Open Pro rims with DT Revolution 14/17 spokes. The crankset is a Campagnolo Super Record with a Nuovo Record bottom bracket and a bottom bracket adapter from the QBP catalog. A Campagnolo Record brake and lever stops every thing when my legs can't. Note, also the Nitto Dirt Drop stem and Moustache bars. It is currently geared 42/17 in deference to a sudden onset of knee pain. The ride of this thing is sublime! It tracks straight and is very compliant vertically yet does not seem to wind up on climbs or sprints. If you weren't aware of what you were riding, you would swear you were on a good quality road frame. I call it The Monster or Super Typhoon. Rick Chasteen lives in the US and favours fixers on and off road.